There’s a regimental headquarters overseeing operations in volatile northern Helmand province, Afghanistan. Regimental Combat Team-8, out of Camp Lejeune, N.C., took over for Lejeune’s RCT-2 on Sunday. Photographs of the relief in place ceremony are posted here. The regiment operates out of Delaram II, a forward operating base in neighboring Nimroz province. Commanded by Col. Eric Smith, it will oversee operations in most of northern Helmand province, including violent Sangin district, where dozens of Marines with 3rd Battalion, 5th Marines, out of Camp Pendleton, Calif., have died since October. Other units that fall under RCT-8 include Lejeune’s 1st Battalion, 8th Marines, based in Musa Qala and Now Zad; and elements of 3rd Battalion, 25th Marines, out of Brook Park, Ohio. The reservists with 3/25 are working with Danish troops to train Afghan troops. RCT-8’s Marines already have had one major wakeup call. 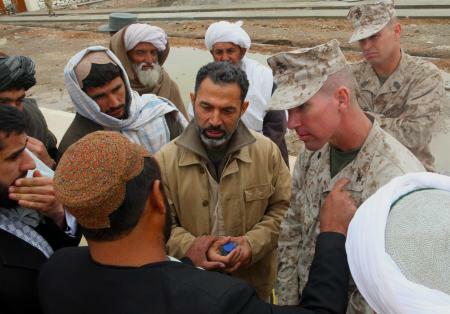 In the same timeframe as most of its Marines began arriving in Afghanistan, RCT-2’s commander, Col. Paul Kennedy, was attacked last month with a rock thrown during a meeting with Afghan civilians. It broke his nose, and the Marines in his security detail killed the man.